Yesterday was the 107th anniversary of Oklahoma’s statehood: on 16 November 1907 the Union admitted its 46th state when Indian Territory and Oklahoma Territory combined to form the new state of Oklahoma. Residents throughout the state celebrated with wild jubilation and a “red letter” campaign. The commercial bodies and immigration organizations of the state have assisted in making this a “red letter day” in fact as well as in name by printing thousands of red letters announcing the resources and opportunities of the new commonwealth. These have been distributed all over the state and are being mailed by Oklahomans today to their relatives and friends in other states. 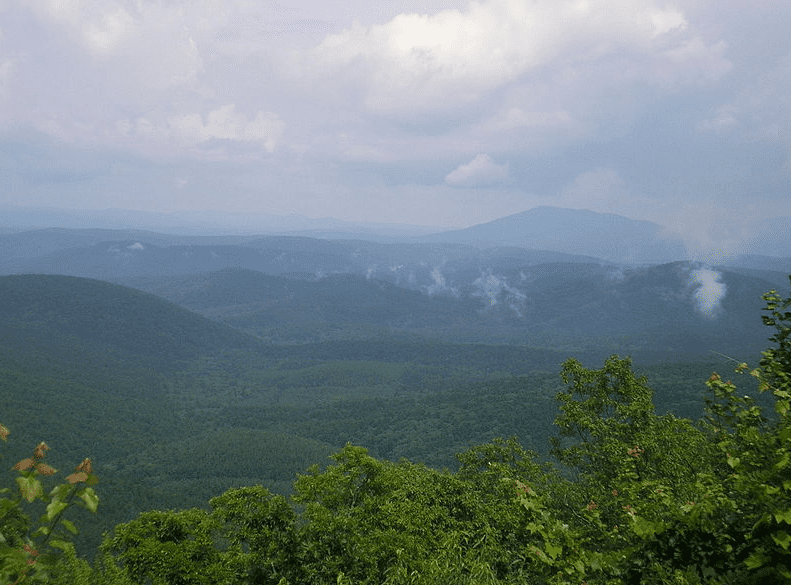 Photo: Ouachita Mountains in southeastern Oklahoma. Credit: Okiefromokla; Wikipedia. Also, did you know that the name of the state originated from a Muskogean Indian word? “Oklahoma” comes from the Choctaw words “oklah homma,” which means “red people.” Many Indian tribes including Cherokee, Chickasaw, Choctaw and Seminole reside in Oklahoma today because Oklahoma was designated by the U.S. government as “Indian territory” in the Indian Removal Act of 1830. If you are researching your ancestry from Oklahoma, you will want to use GenealogyBank’s online Oklahoma newspaper archives: 55 titles to help you search your family history in the “Sooner State,” providing coverage from 1871 to Today. There are more than 2.8 million newspaper articles and records in our online OK archives! Oklahoma is particularly rich in Native American newspapers given the state’s history, which resulted in one of our nation’s largest populations of American Indian people. Dig deep into the online archives and search for obituaries and other news articles about your ancestors in these recent and historical OK newspapers online. Our Oklahoma newspapers are divided into two collections: Historical Newspapers (complete paper) and Recent Obituaries (obituaries only). Here is our complete list of online Oklahoma newspapers in the archives. Each newspaper title in this list is an active link that will take you directly to that paper’s search page, where you can begin searching for your ancestors by surnames, dates, keywords and more. The OK newspaper titles are listed alphabetically by city. You can either print or create a PDF version of this Blog post by simply clicking on the green “Print/PDF” button below. The PDF version makes it easy to save this post onto your desktop or portable device for quick reference—all the Oklahoma newspaper links will be live.